A memorial set up outside of the Milton house where George H.W. Bush was born is growing as people with all different political views honor the former president's life in unique ways. One man, Bill Cameron, played the Navy Hymn on his bagpipes outside of the home. "I said, 'You know what, I'm gonna stop at the Bush house and just play,'" he said. 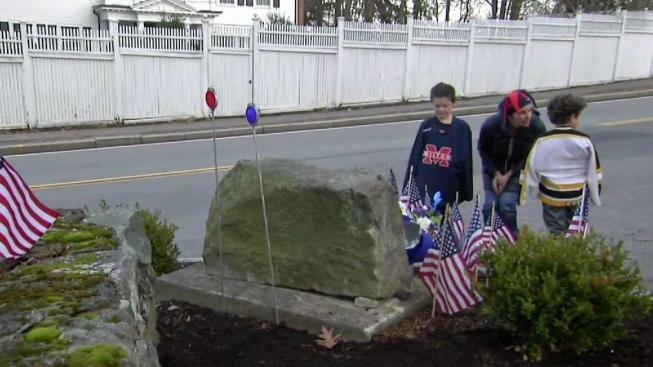 Joanna Mannion used the memorial as a history lesson for her sons Charlie and Theodore. "What number president was he? 41. What number was his son, do you remember? 43," she told the boys. Mannion wants her sons to learn about Bush's life. "It's really important to me to have my sons understand that we live in an awesome, amazing city with so much history. Even recent history. Pay our respects to our best one-term president we have ever had," she said. Others honored the late president through tears. "It's a passing of a generation. I don't know why I am so emotional to be honest with you," Lynda Lee Sheridan said. Even those who disagreed with the former president's views made sure to bow their heads, snap a picture, lay flowers or add an American flag. There were hundreds of ways of showing appreciation, with all of them giving thanks for his contribution in shaping the country. "The idea of honoring each other is very important," Mary Anne Connolly said.